Conflict has arisen in Dublin CA, over a new water park the city is building. The park will require 480,000 gallons to fill, and will have features that spray or dump water through the air, increasing evaporation. City officials already admit that they may have to mothball parts of it until the drought is relieved. Local residents worry that the city is spending millions to build a boondoggle that will be unusable because of the drought. Can California afford to have water parks at a time when its reservoirs are at historic lows (Nir 2015)? 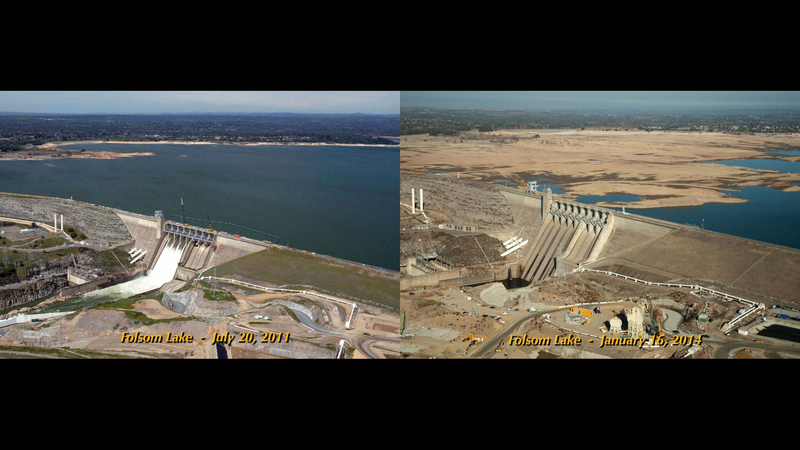 Folsom Lake in 2011 and 2014. Source: California Department of Water Resources via NASA. Conflict has arisen in Folsom, California over proposals to build new housing developments. Folsom Lake, the local reservoir, is one of the poster children for the California drought (photo at right). The city manager argues that the drought is temporary, and that Folsom’s water rights will easily support the additional housing. But is the drought temporary? When current residents have been required to reduce water consumption by up to 34% in some locations, can the state support increased population, more housing, and the consequent increase in water consumption? On the other hand, if California stops building new housing, what will happen to the economy (Nagourney 2015)? Emergency Water Distribution Tank, East Porterville, CA. Source: Community Water Center. These stories illustrate the types of problems with which California will increasingly have to wrestle. Many economic forecasts for California don’t seriously consider the drought. I found only two studies that focused specifically on its effects. Both focused on the agricultural sector. The Giannini Foundation Study (Hanak and Mount 2015, Medellin-Azura et al 2015, Howitt, Medellin-Azuara, MacEwan, Lund, and Sumner et all 2015, Sumner 2015, and Howitt, MacEwan, Medellin-Azuara, Lund, and Sumner, 2015) focuses on the entire Central Valley. The Fresno State Study (Zelezny et al 2015) focuses on the San Joaquin Valley, the southern 2/3 of the Central Valley. These studies conclude that in 2015 the economic effects of the drought on the agricultural sector are being mitigated by some factors that act like buffers. The most important is that farmers are substituting groundwater for their lost surface water. Although this results in increased costs, it mitigates the drought’s effects. In a sense, by building so many reservoirs, California has adopted a similar buffering strategy, allowing the state to draw down the reservoirs during times of drought. A second factor involves crop switching, though in exactly the opposite direction discussed in Part 7 of this series. The most profitable farm products, nuts and grapes, require more labor than do field crops like alfalfa and corn. Farms with secure water rights are switching to nuts and grapes, even though they are more water intensive. As a result, it is buffering the loss of farm jobs occurring because of fallowed land. The authors also noted that, as arcane as the current system of water rights is, it allows senior water rights holders with lower value crops to sell their water to farms with higher value crops. Thus, alfalfa growers, if they have senior water rights, can fallow their fields and sell their water to almond growers. I should make an aside here that the same system allows farmers with senior water rights to sell their water to urban areas that have water shortfalls. 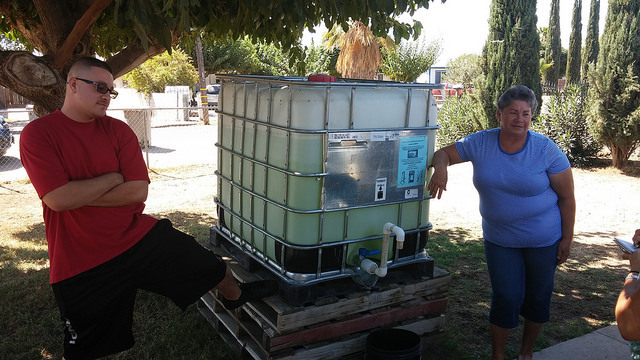 In fact, some water systems in Southern California already purchase water from farms to supplement their supplies. Overall, the studies estimate that the drought will result in $2.6 to $3.4 billion of lost economic output in 2015. California’s gross state product in 2013 was about $2.2 trillion, so the loss would represent less than 0.2% of California’s total economic output. The studies estimate that the drought would cause the loss of about 18,600 farm jobs and 564,000 idled farm hands. Regional unemployment is high, ranging from almost 10% to almost 14% in the San Joaquin Valley, but it is due to the continuing effects of the Great Recession, not the drought. Even though crop switching has reduced the loss in farm jobs, the number of farm workers decreased to 169,000 in 2014, from a high of 192,000 in 2010 (a decrease of 12%). While locally the impact may be severe, as in East Porterville, the impact is small on the scale of the whole state. The effects of the drought are so small for two reasons. First, the two studies consider the drought as an isolated one-year event. They both emphasize that, if the water shortage continues, the economic effects will become much more dire, but neither study does the analysis. Second, the studies consider only one region of the state. The regions of highest economic activity lie outside the area studied, and are not included. This series has emphasized, however, that drought affects the entire state, and it is likely to become the “new normal” in California. In the future California will face an annual deficit of 25.1 million acre-feet, or 39% of its annual dedicated water supply. Over time, the buffering strategies described above are likely to be exhausted: you can’t draw down aquifers and reservoirs forever, at some point they go dry; you can’t sell your water allocation if it has been cut off; you can’t switch to nuts and grapes if there is no water for them. I found only one study that looked at the economic consequences if a region of California lost a significant portion of its water, and the loss was not buffered or replaced by other water sources. This study (the Seidman Foundation Study) asked what the economic consequences would be if water from the Colorado River was lost. It considered the 7 states that depend on water from the Colorado River, but in California it considered only the 7 Southern California counties that receive Colorado River water: Imperial, Los Angeles, Orange, Riverside, San Bernardino, San Diego, and Ventura (which I will call the Colorado River Water Region, or CRWR) (James et al 2014). This region includes two of the largest producing agricultural counties in the state, Imperial and Ventura, but it also includes huge metropolitan areas: Greater Los Angeles and San Diego. The Colorado River accounts for about 92% of agricultural water supply, and 37% of municipal water supply in the CRWR. The study found that if Colorado River water were cut off for a year, the CRWR would suffer $657 billion in economic loss. This loss would represent 55% of the regions total economy! The sectors with the largest losses would be real estate and rental, public administration, and healthcare-social services. The sector with the smallest losses would be agriculture-forestry-fishing-hunting – the percentage of loss would be high, but the raw amount would be small because the sector is such a small part of the overall economy. Job losses would total over 7 million. Since employment in the CRWR is 10 million (California Economic Development Department 2015), the loss of employment would be a staggering 70%! I want to note two aspects of the study. First, it assumed that the lost Colorado River water would not, and could not, be replaced. Second, the study used a linear model, whereby the effects on the CRWR would be proportional to the amount of water lost. That is, if 10% of the Colorado River water were lost, the effects would be 10% of the total. If 50% were lost, the effects would be 50%. These characteristics will make this study useful as a basis to extrapolate to all of California. Thus, the data suggests that the economic effects of the drought have not yet been particularly severe because buffering strategies have mitigated them. Without the buffering strategies, the effects may well have been severe. However, buffering strategies are unlikely to be useful under the scenario that I envision. Since no published studies exist that directly address the question, in the next post I will begin the process of constructing an estimate of the economic losses the future water shortage will cause in California. California Department of Water Resources (photo). 2/25/14. Drought in Folsom Lake, California. Via NASA, https://www.nasa.gov/jpl/multimedia/california-drought-20140225/#.VdYLrHtpey0. California Economic Development Department. 2015. Labor Force and Unemployment Interactive Map. Webpage accessed 2015-09-01 at http://www.labormarketinfo.edd.ca.gov/LMID/Geographic_Information_Systems_Maps.html. Community Water Center (photo). Emergency Water Distribution Tank, East Porterville CA. Downloaded 9/2/2015 from http://www.communitywatercenter.org/drought. Castillo, Andrea. 2015. “Drought Disaster in East Porterville Turns to Budding Health Crisis.” Fresno Bee. 6/20/15. Accessed online at http://www.fresnobee.com/news/state/california/water-and-drought/article25023559.html. Glenza, Jessica. 2015. “The California Town With No Water: Even An ‘Angel’ Can’t Stop the Wells Going Dry.” The Guardian. 4/20/15. Accessed online at http://www.theguardian.com/us-news/2015/apr/20/east-porterville-california-drought-bottled-water-showers-toilets. Hanak, Ellen and Jeffrey Mount. 2015. “Special Issue: The Economics of the Drought for California Food and Agriculture.” Agricultural and Resource Economics Update, Giannini Foundation of Agricultural Economics. Downloaded 8/26/2015 from http://giannini.ucop.edu/media/are-update/files/issues/V18N5_g9jdEzd.pdf. Howitt, Richard, Duncan MacEwan, Josue Medellin-Azuara, Jay Lund, and Daniel Sumner. 2015. Preliminary Analysis: 2015 Drought Economic Impact Study. Downloaded 8/26/2015 from https://watershed.ucdavis.edu/files/biblio/2015Drought_PrelimAnalysis.pdf. Howitt, Richard, Josue Medellin-Azuara, Duncan MacEwan, Jay Lund, and Daniel Sumner. 2015. “Economic Impact of the 2015 Drought on Farm Revenue and Employment.” Agricultural and Resource Economics Update, Giannini Foundation of Agricultural Economics. Downloaded 8/26/2015 from http://giannini.ucop.edu/media/are-update/files/issues/V18N5_g9jdEzd.pdf. James, Tim, Evans, Anthony, Madly, Eva, and Kelly, Cary. 2014. The Economic Importance of the Colorado River to the Basin Region. Phoenix, AZ: Seidman Research Institute, Arizona State University. Downloaded 8/26/2015 from http://seidmaninstitute.com/protect-the-flows. Medellin-Azuara, Josue, Duncan MacEwan, Jay Lund, Richard Howitt and Daniel Sumner. 2015. “Agricultural Irrigation in This Drought: Where is the Water and Where Is It Going?” Agricultural and Resource Economics Update, Giannini Foundation of Agricultural Economics. Downloaded 8/26/2015 from http://giannini.ucop.edu/media/are-update/files/issues/V18N5_g9jdEzd.pdf. Nagourney, Adam. 2015. “Losing Water, California Tries to Stay Atop Economic Wave.” New York Times, 8/19/2015. Retrieved online at http://www.nytimes.com/2015/08/20/us/losing-water-california-tries-to-stay-atop-economic-wave.html?ref=earth. Nir, Sarah. 2015. “California Town, United by Drought, Is Split Over New Water Park.” New York Times, 8/15/2015. Retrieved online at http://www.nytimes.com/2015/08/16/us/california-town-united-by-drought-is-split-over-new-water-park.html. Sumner, Daniel. 2015. “California’s Severe Drought Has Only Marginal Impacts on Food Prices.” Agricultural and Resource Economics Update, Giannini Foundation of Agricultural Economics. Downloaded 8/26/2015 from http://giannini.ucop.edu/media/are-update/files/issues/V18N5_g9jdEzd.pdf. Zelezny, Lynette, Xuanning Fu, Gillisann Harootunian, David Drexler, Antonio Avalos, Ndeil Chowdhury, Fayzul Pasha, Samendra Sherchan, Jes Therkelsen, Chih-Hao Wang, David Zoldoske, Sargeant Green, and Cary Edmondson. 2015. Impact of the Drought in the San Joaquin Valley of California. Downloaded on 8/26/2015 from http://www.fresnostate.edu/academics/drought. By mogreenstats in Climate Change, Consumption and Supply, Other Climate Change, Water on 2015/09/03 .